In commercial gyms everywhere, warming up constitutes little more than spending fifteen or twenty minutes on a bike, treadmill, or stair climber. 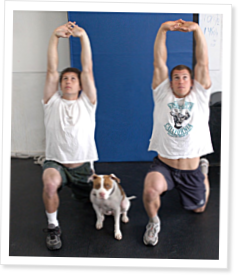 While better than nothing, this approach to warming up is largely a waste of time in that it will not improve flexibility, does not involve the whole body or major functional movements, misses an ideal opportunity for reinforcing and practicing some critical exercises, and poorly prepares an athlete for rigorous athletic training. We need a warm-up that will increase body temperature and heart rate, provide some stretching, stimulate the entire body and major biomechanical functions, provide practice for basic movements, and finally, prepare for rigorous athletic training. We offer here a favorite CrossFit warm-up and compare the advantages that it has over riding a stationary bike for fifteen minutes. The CrossFit warm-up satisfies our needs whereas the traditional warm-up only leaves us with an elevated body temperature and heart rate. The essential features of our warm-up are that they include a stretch and major hip/leg extension, trunk/hip extension and flexion, and pushing and pulling movements. The combinations are limitless and might include more challenging movements like good mornings, hollow rocks, rope climb, or handstand push-ups in place of back extensions, sit-ups, pull-ups, and dips. The movements used will largely depend on your athletic development, but over time the more challenging movements can be included without being a whole workout.